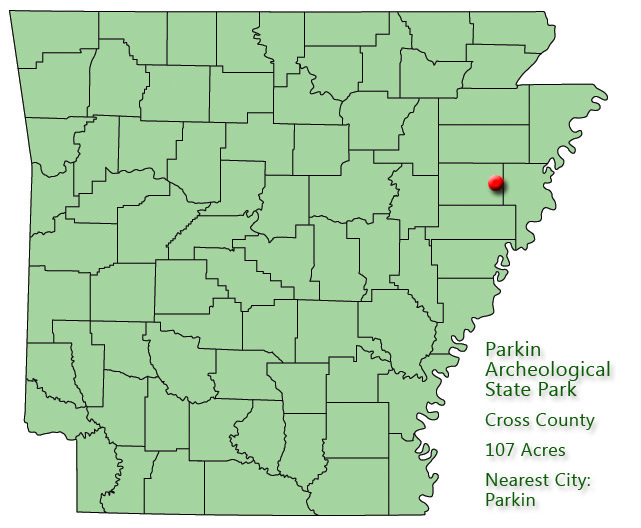 Parkin Archeological State Park in northeast Arkansas preserves and interprets a Mississippian period Native American village that existed from approximately AD 1000 to 1550. 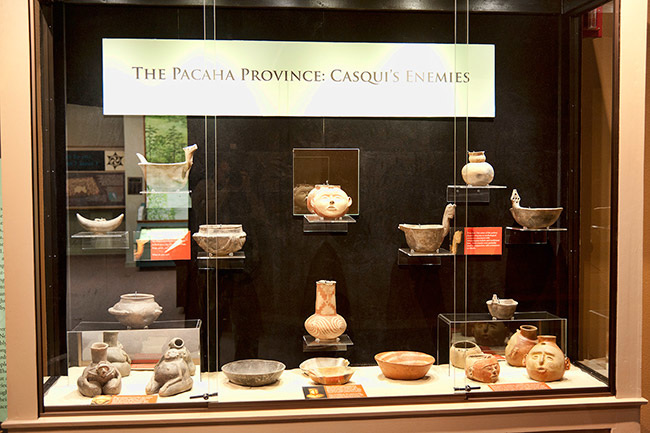 European-made trade items from the era of Hernando DeSoto’s expedition recovered at the park and written descriptions of the village support theories that the Spanish visited the Parkin Site in 1541. Many archeologists believe the site may be Casqui, mentioned prominently in the DeSoto journals. Remnants of Indian villages similar to the Parkin Site were once numerous in eastern Arkansas, but soil erosion, careless digging, and farming destroyed virtually all of them during the nineteenth century. The prehistoric village on the eastern bank of the St. Francis River covered about seventeen acres and was enclosed by the river on the west and a soggy moat on three sides. Archaeological studies have determined a wooden palisade also surrounded the village. 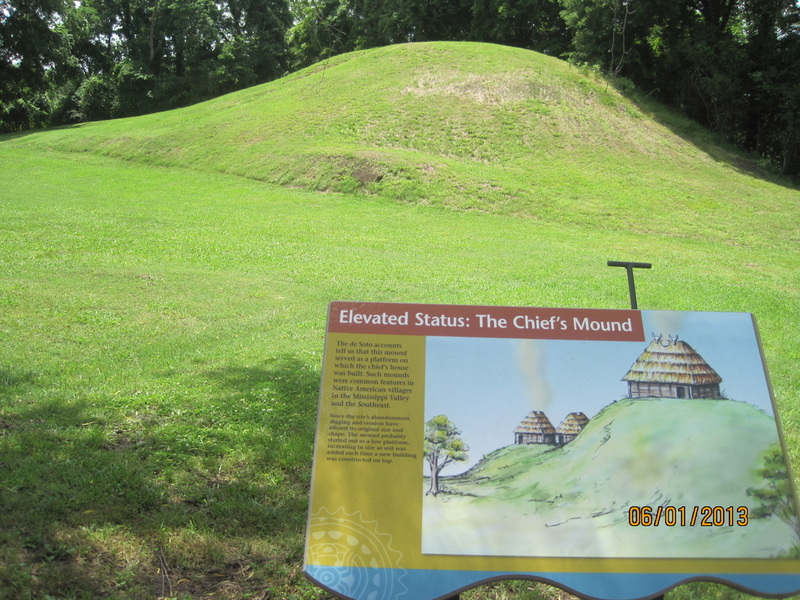 A large platform earthen mound, built by the natives, still overlooks the river today. It is believed to be the most intact (that is, undisturbed by looters) native village of its time period remaining in northeast Arkansas. The Parkin Site was protected in an unusual way. After the town of Parkin in Cross County was established in 1887, cotton farmers could not cultivate across the wide ditch that once served as the village’s protective moat. A sawmill and homes were constructed within and around the historic village site, and all of this activity actually helped preserve the site. This week we will learn more about this remarkable site. The explore DeSoto is closely connected with the Parkin Archeological site. 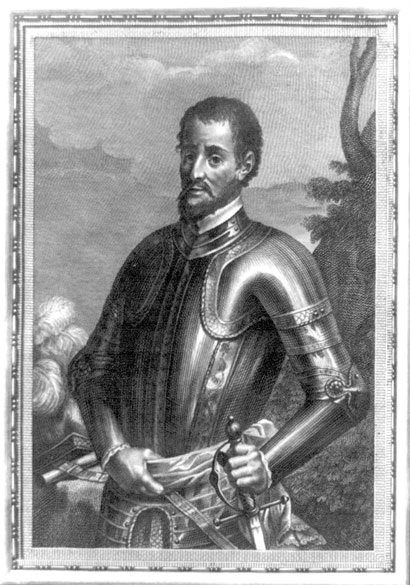 Hernando de Soto was a Spanish explorer who led an expedition into the southern United States. He and his soldiers were the first Europeans to set foot in what is now Arkansas. Four written accounts of the expedition provide details about his trek through the state. 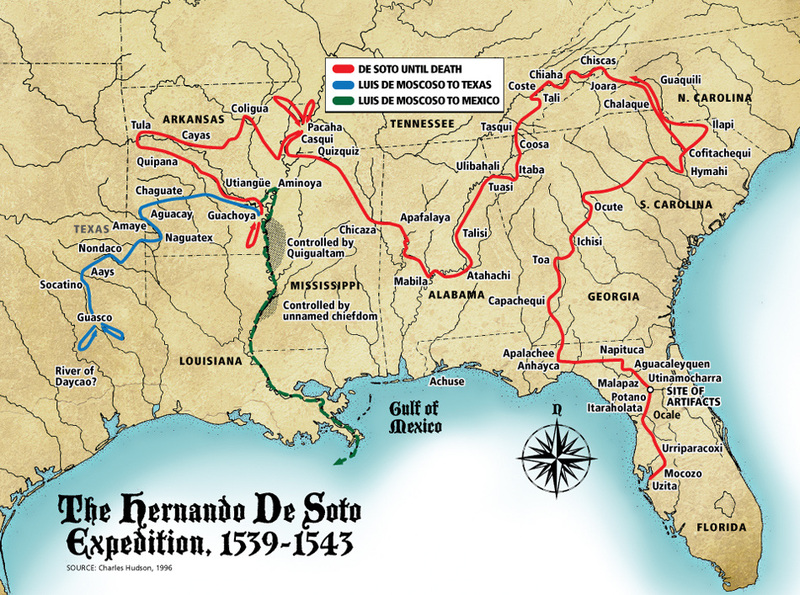 In May 1539, de Soto set out on the expedition from Cuba than eventually found him in Arkansas. He had about 600 men, plus horses, pigs, and equipment. His contract with the King of Spain required him to explore the region and establish settlements and forts. After landing on the southwest coast of Florida, the crew traveled through the Southeast before crossing the Mississippi River into what is now Arkansas on June 28, 1541. The explorers were the first Europeans to set foot in Arkansas. The four known accounts of the expedition describe the Indians they encountered in the next two years. Scholars have long debated the actual route, but archaeologists have discovered small brass bells and other Spanish artifacts at a few archaeological sites—evidence of the expedition. Relations with most Indians of Arkansas were relatively friendly, but de Soto and his soldiers thought nothing of torturing and killing those who refused to cooperate. His primary aim was the gaining of riches, and present-day Indians in Arkansas and other Southern states view him as a murderer. The gold and other riches they sought were not to be found, and almost half of the original 600 men had been killed since landing in Florida. The de Soto expedition was ultimately a failure. When he arrived in Arkansas, he still saw himself as a gallant conqueror, but, by the time of his death, his spirit was broken. The actual location of his burial is not known. 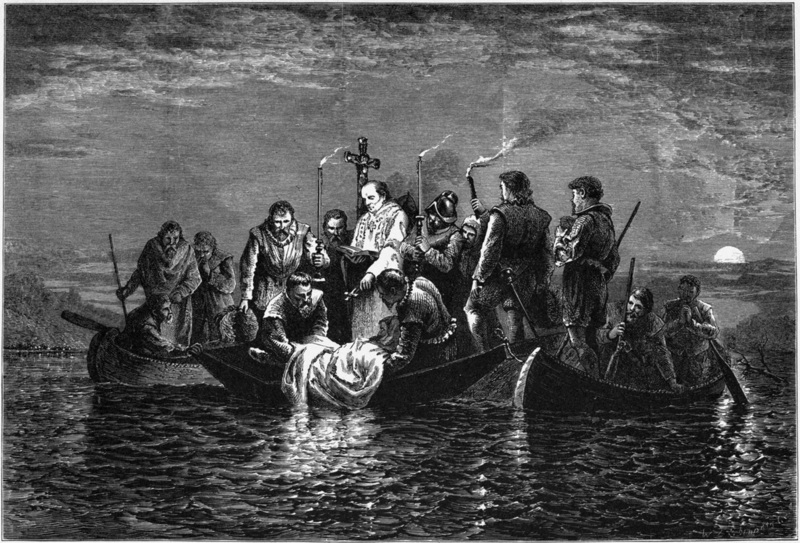 According to one source, de Soto's men hid his corpse in blankets weighted with sand and sank it in the middle of the Mississippi River during the night. It is said that the chief of a tribe in area where Arkansas is today asked De Soto if his God could make it rain. 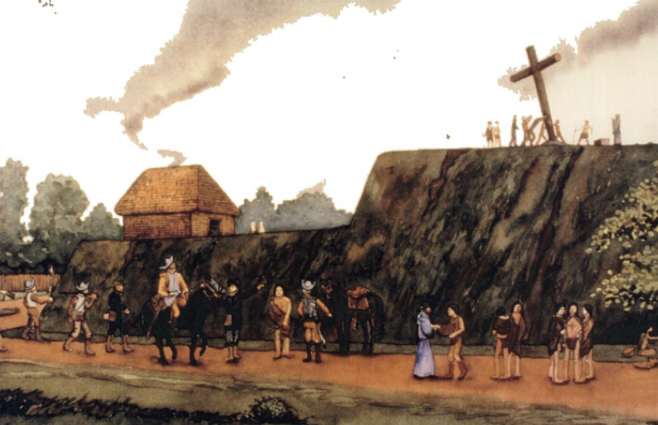 De Soto built a Christian cross as tall as a tree on one of the mounds. The Roman Catholic priests with him conducted a religious service, while according to one of the accounts of De Soto's men, fifteen thousand Indians watched. The Spaniard who wrote this episode claimed that it did rain several days later. No one knew for sure exactly where this took place, although most believed it was somewhere in Arkansas. You will hear more about this cross tomorrow which has recently been in the news. Archaeologists unearthed what they believe are remains of a large wooden Christian cross Spanish explorer Hernando de Soto placed atop a hill in 1541 at what is now part of Parkin Archeological State Park in Cross County. Jeffrey Mitchem, the Parkin park site archaeologist for the Arkansas Archeological Survey, said he will send a 2-foot chunk of baldcypress thought to have been used for the cross more than 500 years ago to the University of Arkansas at Fayetteville next week for further testing. Archaeologists first found a large wooden post at the site in 1966 while covering holes left by looters and surmised it could be de Soto's cross. Carbon-dating conducted then indicated the post was cut from a cypress tree between 1515 and 1663. In the 1900s to 1940s, a lumber company built atop the land, preserving the site along the St. Francis River, Mitchem said. The Parkin park opened in 1994. "It's in the ballpark," he said of the carbon-dating results. "We want to do further testing to make sure." Mitchem learned of the discovery of the potential cross in 1992 and began his research, theorizing then that the wood was from de Soto's cross. "It became my career," he said. 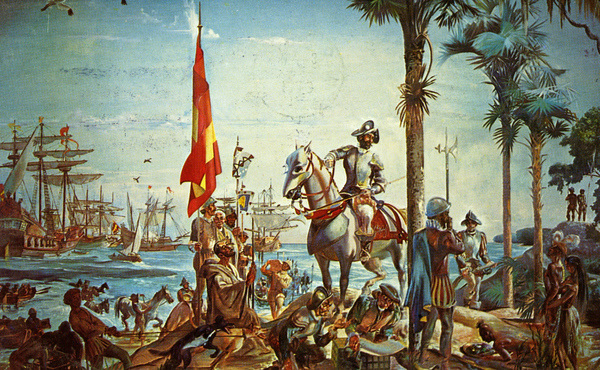 De Soto and his explorers, including several Catholic priests, landed in Florida in 1539 and forged across the southeastern United States seeking gold and other riches. He crossed the Mississippi River into Arkansas in June 1541 and traveled to Casqui, an Indian village named after its chief, which is now the site of the state park. According to four accounts of the journey written by de Soto's voyagers, de Soto ordered several of his men to cut a tall cypress tree and build a massive cross. On July 4, 1541, about 100 men raised the cross, according to the written accounts. The Parkin artifact may be one of only two crosses de Soto placed while in the United States, said Patricia Galloway, a professor of the School of Information at the University of Texas at Austin, who has studied de Soto's U.S. exploration. "He may have placed it to impress the natives, but he was traveling with several priests and most of the places he stopped were not friendly," she said. "This [Casqui] may have been one of the few safe spots." 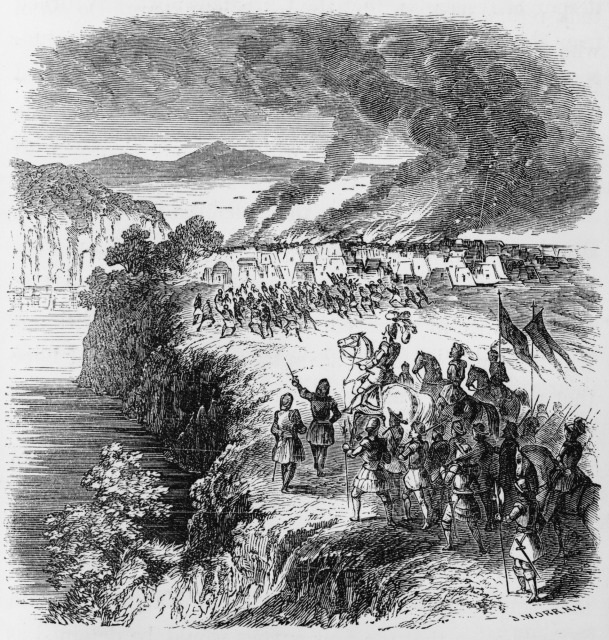 Mitchem said that the Arkansas site may have been one of only a few places de Soto and his men could "relax" and not battle tribes. Galloway said she was sure de Soto did not convert the Indians there to Christianity, but the natives may have accepted the cross because de Soto's men helped Casqui and his village overcome a warring tribe. "They would be perfectly happy if he left it there," Galloway said. "It may have been a sign of victory. A sign of the village was not to be messed with." Recently, Mitchem and his team began work. Survey archaeologist Tim Mulvilhill located the cross's spot, which was marked by UA archaeologists in 1966. The team then found a section of wooden post Tuesday buried about 2 feet into the soil atop the park's largest mound. Much of the wood was rotted or burned. A portion of the post was still wrapped in plastic covering, left by archaeologists 50 years ago. "The best indication that this is DeSoto's cross is if the carbon-14 testing says it's from 1541," he said. "But that wood may not be enough to tell. "Everything about it, though, indicates it is his cross," Mitchem said. "The location, the baldcypress used and the Spanish artifacts we found there. Everything points to the fact that it is what we believe." "To me, this is pretty incredible," Mitchem said. "I've been dreaming about doing this my whole career." "Wood Found In Arkansas Thought To Be Remains Of Cross Left In 1540S". Arkansas Online. N.p., 2016. Web. 29 Apr. 2016. In 1965, the University of Arkansas held a field school at the site, and in 1966, the Arkansas Archaeological Society held its annual training program there. The reason for both was to determine if there were enough intact deposits to warrant turning the site into a state park. Although authorized by the state legislature in 1965, the first “Parkin Mound” land was not acquired until 1975. Several homes and a church occupied the village site, and individual land parcels were purchased in phases over a period of years. Initial park development started in 1991, and the new visitor center complex was dedicated on October 29, 1994. 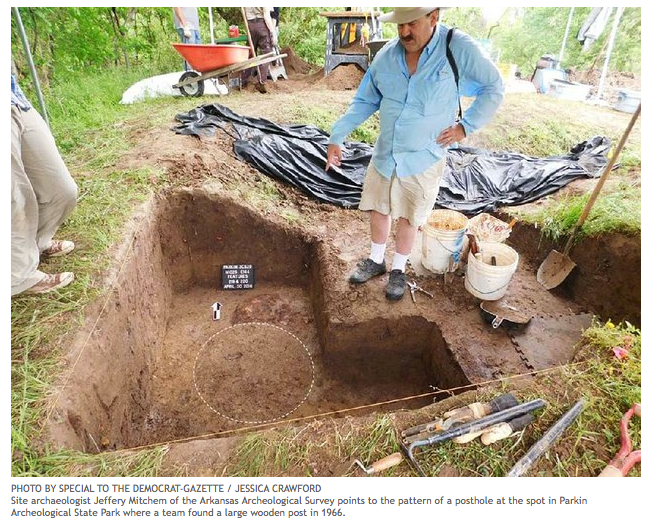 Since its beginnings, the park has operated under a partnership with the Arkansas Archeological Survey, a unit of UA. A research station is located in the visitor center. Visitors can watch research in progress and see firsthand the results of excavations and laboratory analysis. While finding conclusive evidence that de Soto did visit Parkin would be an important discovery, the archaeologists are more focused on learning about the residents of the ancient village, including how they lived and why they stopped living there sometime after the Spaniards departed. 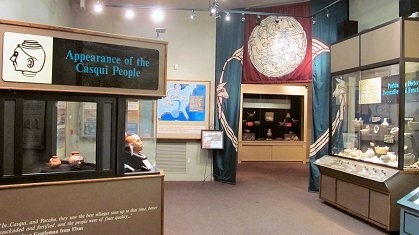 In addition to the research laboratory, the visitor center also houses a large exhibit hall, which includes a small museum that tells the story of the Parkin site and includes artifacts, a glass open storage area where more artifacts may be viewed, an audio-visual theater showing the story of the site, and a gift shop. The park includes a paved trail, pavilion, picnic area, playgrounds, and boat ramp.